The dark mist hanging low over the valley has started to break up and the shadowy outline of the enemy army has begun to take shape. It is unnaturally quiet and both sides can now hear the sounds of movement and preparation made by each other as they assemble for battle. As the heroes move into position, the Ranger and Rogue head out toward a rock formation near the left flank of the main battlefield. The Paladin, sitting gallantly upon his steed, raises his sword and looks to the Wizard for guidance. With a nod from the wizened mage, the Paladin charges forward, trailed by the Barbarian and the Dwarf. From the far side of the field, General Gorgutt, the savage Orc commander, emerges from the woods, swinging battle axes in each hand. He is followed closely by the ominous figure of the blue dragon, Sapphire. Both sides are evenly matched and they are bringing everything they have to wage this battle. The fate of the Realm lies in the balance. Defenders of the Realm: Battlefields is a competitive game that brings the epic battles for the Realm to life for 2-4 players. One player, or team, will control the Generals and minions of the Dark Lord's armies while the other player, or team will defend the Realm with the greatest Heroes of the era. Play is fast and furious as the players bring their forces to bear turning the once peaceful cities, forests, mountains, and valleys of the Realm in to epic battlefields. Lead your army to victory on these battlefields and the Realm will be yours. 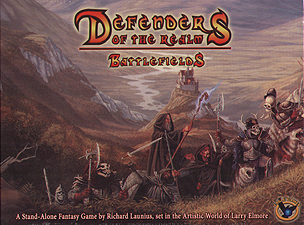 Note: Defenders of the Realm: Battlefields is a stand-alone game. The Defenders of the Realm board game is not require to play this game.